Rebound Therapy - Children's Therapy Solutions : Children's Therapy Solutions Ltd.
Children’s Therapy Solutions are able to offer this intervention, as part of their expert skills, to meet children’s sensory motor needs. A wide range of children can benefit from this intervention. 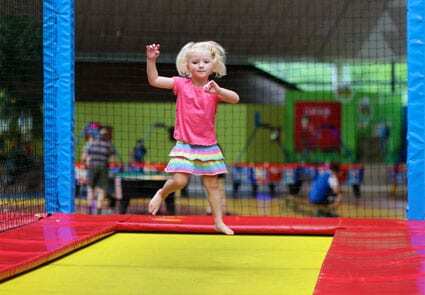 Rebound Therapy describes the therapeutic use of trampolines. The trampoline is skilfully used by the therapist to facilitate movement; promote movement patterns and control; promote balance; promote an increase or decrease in muscle tone; promote relaxation, interaction and co-operation; promote sensory integration and to improve communication skills. The unique properties of the trampoline offer ample opportunities for enhancement of sensory motor experiences, development and learning. The work is intrinsically motivating and returns high value in therapeutic terms. Movement can be facilitated at different stages of the bounce. A tiny body movement can produce a large effect with correctly applied bounce. Momentum and rhythm can be added to movement to help teach new movement skills and energise movement. Balance and equilibrium reactions can be achieved through stimulation of postural mechanisms; by creating a dynamic movement situation, protective and saving reactions can be developed. The anticipation of movement occurs because of the effects of timing, rhythm and momentum. An inhibiting or stimulating effect on muscle tone enables active movement to take place. By using good positioning and low amplitude bouncing, good relaxation is easily obtained. Body image, body part awareness and positional sense are enhanced through tactile and joint sensation. Increased perception of body image, spatial awareness combined with rhythm, and movement itself, greatly develop co-ordination. The experience of movement into space with the return to stability, while remaining in control, provides an enriched learning experience. All of our Therapist have undertaken additional post registration approved, validated and certified Rebound Therapy Training.